Magdeburg, Germany, September 4, 2018 – About one third of patients who have suffered a stroke end up with low vision, losing up to half of their visual field. This partial blindness was long considered irreversible, but recent studies have shown that vision training after optic nerve and brain damage can help restore or improve vision. A new study published in the journal Clinical Neurophysiology reports on key mechanisms of vision restoration: attention. Hemianopia is a decreased vision or blindness in half the visual field, usually as a consequence of stroke or trauma to the brain. It greatly reduces quality of life, affecting patients' reading, driving and spatial navigation. "Knowledge in this field is still rather fragmentary, but recent studies have shown that vision can be partially restored by vision training, which improves the deficient visual field sectors," explains Prof. Bernhard Sabel, PhD, Director of the Institute of Medical Psychology at Magdeburg University, Germany, co-investigator of the study. "Neuroimaging evidence supports a possible role of attention in this vision restoration." 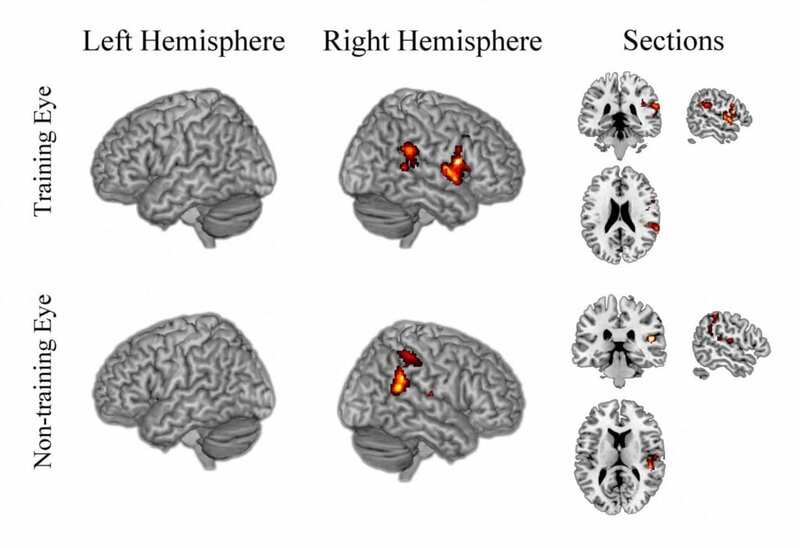 The study confirmed this hypothesis by obtaining evidence from functional magnetic resonance imaging (fMRI) that visual training led to functional connectivity reorganization of the brain´s attentional network. Seven chronic hemianopic patients with lesions of the visual cortex took part in vision rehabilitation training for five weeks. After the pre-tests all received training sessions lasting one and a half hours per day for six days per week for five weeks. Each training session, lasting about 60 minutes, was composed of six blocks with 120 training trials each, during which participants had to respond to specially designed visual stimuli on a computer monitor. The pre- and post-test included perimetry testing, contrast sensitivity testing and fMRI scanning one or two days before and after training, respectively. Each contrast sensitivity test consisted of 420 trials in six blocks. The visual rehabilitation training was performed with one eye open, which was randomly chosen, while the non-trained eye was covered with an opaque eye patch. After training, the patients had significantly improved visual function at the training location, and fMRI showed that the training led to a strengthening of the cortical attentional network connections between the brain region of the right temporoparietal junction (rTPJ) and the insula and the anterior cingulate cortex (ACC). "Our MRI results highlight the role of attention and the right TPJ activation as a component of vision restoration training in hemianopia," notes lead investigator Yifeng Zhou, DSc, of the Hefei National Laboratory for Physical Sciences at Microscale and School of Life Science, University of Science and Technology of China, Hefei, P.R. China, and State Key Laboratory of Brain and Cognitive Science, Institute of Biophysics, Chinese Academy of Sciences, Beijing, P.R. China. "However, it is unclear whether the rehabilitation of attentional networks is the direct result of training or the result of the rebalancing of bottom-up sensory streams, which should be investigated in future studies." "This discovery that the brain´s attention network is a key mechanism in partially reversing blindness is an exciting advance in the field of restoring vision in the blind, and it opens up new avenues to design new therapies that are even more effective than current methods to help people with low vision or blindness," concludes Prof. Sabel.